The Guild speaker of the Gulu guild-Revamp government , Mr Okello Edmond, hangs on balance after a section of guild representatives filled a petition for a vote of no confidence. The GRCs have made a broad move to remove the speaker from office. On petition received by campus bee, the GRCs allege that the speaker has abused his office, failed to interpret and uphold the constitution and corruption where he paid for DSTV package at a cost less than the money that he was given. “…we believe he is not fit for the office entrusted onto him. 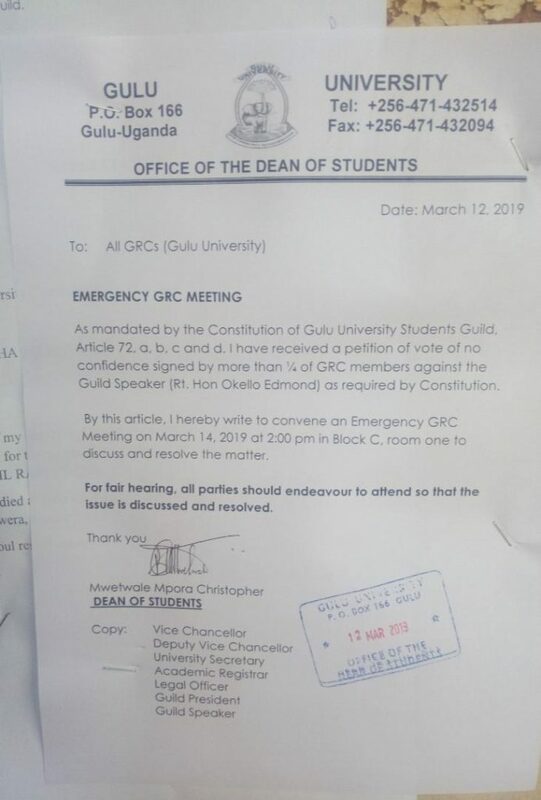 We have insurmountable fear and have lost confidence in free and fairness in the forthcoming coming guild election”, read a section of the petition, by the GRCs, to the Dean of students who is also chairman of the caretaker government. The Dean of students, Mr Mpora Christopher, has swiftly moved in to settle the matters at hand. According the guild constitution, a petition must be signed by a quarter of GRCs and sent to chairperson of caretaker government who should chair the meeting within 14 days. The Dean has called an emergency GRC meeting to discuss the matter. “I hereby write to convene an emergency GRC meeting on 14/3/2019 at 2:00 pm”, reads a notice from Dean. For this to be effected, there should be quorum of at least three fifth of GRCs and at least two third of members present, should vote in favor. This electioneering season has taken a tough toll on the vibrant government as many upcoming aspirants and associated groups scrabble for positions in upcoming guild elections.